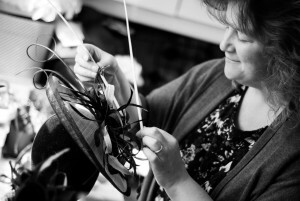 Nicola studied Millinery at the London College of Fashion, and began her career working for The Hat Shop in Covent Garden, London, before setting up her own Millinery Studio at home in Bristol in 1994. Nicola designs and creates bespoke facinators and hats for individual clients, theatrical companies and costumiers. Clients are welcome at Nicola’s home studio for a free consultation, where they will spend time with Nicola, understanding the occasion, sharing ideas, likes and dislikes resulting in a bespoke design idea. Each piece is a one off that has been hand crafted, hand blocked and hand sewn. Nicola’s aim is to create fascinators and hats that reflect the tastes and character of the wearer, and all at very competitive prices.